Rund 20 Minuten hatte Neil MacGregor, der designierte Gründungsintendant des Humboldt-Forums, um die diesjährige Queen’s Lecture zu halten: Doch innerhalb dieser Zeit entfaltete der Direktor des Britischen Museums virtuos einen Bilderreigen, mit dem er dem deutschen Publikum einen tiefen Einblick in die britische Seele offenbarte: Er zeigte, was die bereits seit Jahrhunderten dokumentierte Tierliebe des britischen Königshauses mit der Entwicklung des Parlaments zu tun hat, warum einer der Nachfahren des deutschen Dackels „Daeckel“ – ein Geschenk der Deutschen an Queen Victoria 1845 – neben den Corgis noch heute um Königin Elizabeths II. Beine streift, warum der große britische Komponist George Frederick Handel „durch einen glücklichen Zufall“ auch gleichzeitig der große deutsche Komponist Georg Friedrich Händel ist und warum die Erfinder großer Gartenkulturen am liebsten auf dem nassen Rasen spazieren gehen. Auch den Beweis des britischen Humors bis hinauf ins britische Königshaus blieb der Lecturer nicht schuldig: Das Jahr 1953 habe nicht nur die Krönung des wichtigsten Symbols des Commonwealth, Elizabeth II., Königin von England, gesehen. In deren Schatten sei ein weiteres Symbol Großbritanniens geboren worden, das schnell weltweit bekannt wurde: Ian Flemings Geheimagent Ihrer Majestät 007 „Bond – James Bond“. Das staunende Publikum wurde Zeuge, wie Ihre Majestät zur Eröffnung der Olympiade 2012 in London mit James Bond aus einem Hubschrauber absprang. It is a great honour to be asked to give today this 50th Queen’s Lecture in the context of the state visit to Germany by Her Majesty, known to all of us in Britain as "our Queen" but who has been known in Germany for these last 60 years quite simply as "die Queen". "I would advise anybody who wants to drink coffee in England to mention beforehand how many cupfulls should be made from half an ounce. Otherwise he will get an atrocious mess of brown water set before him." So it seemed better today to focus on something else, something altogether more substantial. The German exhibition at the British Museum culminated in a model of the brilliantly restored Reichs-tag, a building now known around the world as the symbol of a free, constitutional Germany, achieved only after great struggle and terrible suffering. Re-modelled by Norman Foster, it is also a happy symbol of German-British cooperation and of our shared commitment to democratic values. Where our German narrative ended with a building, I should like the British one to begin with an idea: the Crown in Parliament. It is in every way the centre of our national life. And so I want to start this Queen’s Lecture with the Queen’s Speech. Every year the Queen drives in the state coach to the Houses of Parliament to read in the House of Lords the speech setting out her government’s legislative programme. Around her are the Peers, the Members of Parliament and the Judges of the Supreme Court. It is a ceremony that is at the heart of our constitutional legitimacy. All power in the land derives from this source. There can be few more eloquent symbols of our country and of how we have chosen to govern ourselves than this annual re-affirmation of the central role of the Crown in Parliament. "I was much shocked by the open abuse which Members of Parliament flung at each other … In conformity with parliamentary procedure, however, nobody says to another Member’s face that he has spoken like a fool, but turns to the Speaker in the customary way and says, as though addressing the Speaker: ‘The Right Honourable Gentleman has talked a lot of nonsense.’ … The gist of the debate is often lost in bickering and misunderstanding each other. If they go on too long and become tiresome a general cry goes up: ‘The question! The question!’ which must often be repeated many times because both parties invariably want to have the last word." But when the Queen is present it is she who has both the first and the last word. But the Houses of Parliament are only one pole of our political life. The Crown in Parliament must after all be worn by a person. When Her (rigorously a-political) Majesty drives away after delivering the Queen’s Speech, she returns to Buckingham Palace. It was King George III and his wife Charlotte of Mecklenburg-Strelitz who shortly after their marriage in 1761 bought Buckingham House and made here their family home. It is King George and Queen Charlotte who essentially invented the idea of the Royal Family and who set the pattern for much of our national life then and since. They were enthusiastic admirers of the great British composer George Frederick Handel, who by happy coincidence is also the great German composer Georg Friedrich Haendel. And in Buckingham Palace and their house at Kew they led the national fashion for a serious interest in agriculture, plants and, above all, animals. It was very much the model followed by another devoted British-German couple, Victoria and Albert, who continued George and Charlotte's engagement with gardening and animals. The most touching evidence of Victoria and Albert's affection for each other can, I believe, be found not in traditional tokens of love but in their exchange of pets and of the portraits of pets. For Christmas in 1841 Victoria gave to Prince Albert Landseer's portrait of his favourite greyhound, Eos, whom he had brought with him from Coburg when he travelled to London for their wedding in 1840. You know at once you are in the presence of a very powerful personality with an assured elegance - Albert describes Eos as being sometimes contemptuous, but "very friendly if there is plum cake in the room". 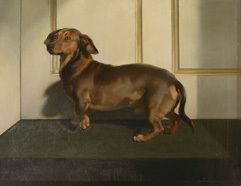 ?Another present that had come from Germany was the affectionate Dachshund Daeckel, given to Queen Victoria in 1845. It is impossible not to see these dogs as real and loved individuals. And it is not surprising that after the birth of their first child, the Queen's birthday present to Prince Albert was Landseer's portrait of both the infant daughter and the - almost equally - adored Eos. Two objects of attention and affection. The child whose feet are being respectfully nuzzled was Princess Victoria, later Empress of Germany. It would be easy to dismiss Landseer as the artist who above all others captures a sentimental British obsession with their animals. But he is I think doing much more. Because he treats animals with a respect normally given to humans, he can explore human society - our society - and our politics through the animals he paints. 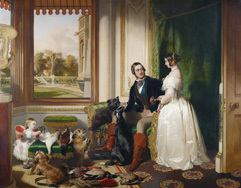 In 1831 he exhibited a pair of dogs, not with the names given them by their owners but titled High Life and Low Life, two portraits that capture the British political world on the eve of the Great Reform Bill. High Life is a magnificent, if rather reflective, Deerhound, seated in a castle, fastidiously averting his elegant gaze from the intruding viewer - i.e. us. Low Life, a tough plebeian Terrier who has clearly been in many street fights, sits calmly beside his beer mug and pipe and looks straight at us. A painting like this makes clear that the English word 'underdog' is far more than just a metaphor. When Landseer's paintings were shown, the whole country was in ferment about the changes needed to the electoral system to allow the Terrier to take his proper place in Parliament along with the Deerhound. I think we can be confident that the street-fighting Terrier would have felt at home in the House of Commons. Continental Europe had the great political revolutions of 1830. We had portraits of dogs. Dogs could not only demonstrate how we lived. More importantly they could show us how to behave. Bob is a model for us all. Twice shipwrecked, he took up residence in the London Docklands and developed a habit for rescuing people from the water. Over 14 years he rescued over 23 people from drowning. In 1831 he was made a distinguished member of the Royal Humane Society and presented with its gold medal and a food supply for life. Landseer's portrait celebrates a national hero who just happens to be a dog. This attributing of human qualities to animals, a British trait much mocked around the world is, however, much more than just sentiment. Britain was the first country in the world to re-cognise that animals, like humans, had rights. They deserved protection not as property, but as themselves. In 1821 Parliament passed an act to protect animals against cruelty. The MP who had proposed it, Richard Martin, discovered that prosecutions were difficult. And so he himself brought a prosecution against a fruit seller for ill-treating his donkey, and to the astonishment of the jury produced the wounded donkey himself in court as evidence. This is courtroom drama of a very high order. It worked and the jury convicted the fruit seller of cruelty. A few years later Queen Victoria took the Society for the Prevention of Cruelty to Animals under her personal protection - hardly surprising after the portraits of her dogs that we have seen - and the RSPCA it has remained ever since. And a royal concern it has also remained. Prince Philip was for many years President of the World Wildlife Fund. In 2004 the Princess Royal unveiled in central London the war memorial to Animals in War and Prince William, Duke of Cambridge, is an energetic campaigner for the protection across the world of elephants and rhinos. "Colds and consumptions are frequent in England … they have a peculiar predilection for walks on the wet grass, and in every public room there are open windows so that it is hardly possible to bear the drafts. Even when they are shut, the wind whistles through them." But Pueckler-Muskau became, in his own words, a Parkomane, obsessed by English gardens and parks, fascinated by the worlds of scholarly fantasy and aesthetic delight created in this damp and drafty climate. English gardens - like the one at Stourhead - had become by the middle of the 18th century a model for the whole of Europe. Here the visitor could go on a grand tour, encountering classical buildings by artificial lakes surrounded by trees brought from all over the world. It was a new way of thinking not just about nature but about human society. No longer laid out on formal paths and avenues, the English garden allows visitors to wander as they will, to explore and discover a world they do not yet know in a way that has not been entirely predetermined by the owner. These gardens are emblems of a certain kind of political liberty. To go for a walk is to consider how, across the centuries, different societies have found new ways of governing themselves well. This is a landscape of ideas. As you wander through the grounds of Stowe you encounter on one side the Temple of Ancient Virtue, recalling the moral example of Greece and Rome and on the other side of the river the Temple of British Worthies showing the great figures of our own national past who can inspire us to a free and virtuous future. 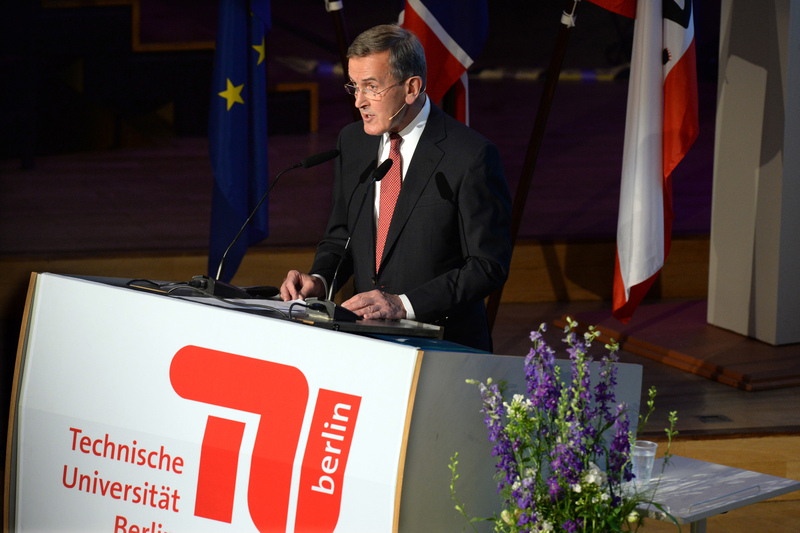 It was a way of thinking about the world that had a great resonance in Germany. In 1789 the Elector of Bavaria created his English Garden where the care of plants and animals could be studied and where the people of Munich could relax. In Woerlitz the English idea was taken even further and the picturesque ramblings allowed you not just to visit the Villa Hamilton in Naples but to witness an explosion of Vesuvius. At the centre of all this in Britain stood King George and Queen Charlotte, who spent a great deal of time along with their 13 children, developing the gardens around their house at Kew. But here you could stroll not just to Greece or Rome, but around the world. The Chinese Pagoda was put up in 1762, and was soon accompanied by the equally exotic mosque. Plants came from all around the globe, often carried by the Royal Navy, and the whole garden was made available to the public in 1759, the year in which the British Museum of objects from all over the world also opened to the public. Queen Charlotte herself was a keen botanist and as newly identified plants were brought to Europe she was eager to collect specimens for Kew. Botanists responded to her encouragement and the extravagantly glamorous Bird of Paradise plant from South Africa was named in her honour as Strelitzia Reginae. Today at Kew the Pagoda of 1762 still stands. Queen Charlotte's tradition has continued and Kew is now the most comprehensive collection of plants anywhere on the planet. As with animals the focus is now above all on conservation. The Royal Botanical Gardens have created a Millennium Seed Bank where today over a billion seeds from all around the world - the billionth was an African bamboo - are stored as a kind of insurance policy against extinction. For the Shanghai Expo of 2010 the British Pavilion was a tribute to this endeavour - the Seed Cathedral designed by Thomas Heatherwick made up of 60,000 acrylic rods containing in total 250,000 seeds. These two examples of gardens and animals show the striking continuity of British life across the turbulent changes of 250 years, and of the steady royal engagement in every aspect of it. I think we can be sure that King George and Queen Charlotte would have approved. And they would surely have been delighted to think that in the Buckingham House which they made their home there is now once again a George and Charlotte. In 1953 the world was able to encounter Britain in two very different ways. It was of course the year of the coronation. A ceremony embodying centuries of history, a consecration and a re-dedication to an enduring set of ideals and principles. Televised for the first time, it was seen by hundreds of millions of people around the world. For everyone in Britain old enough to remember it, it remains a defining experience. In the same year a totally new image of Britain was presented to an enthusiastic global audience. And perhaps surprisingly in this radically other self-definition of our country, the crown was - as always - centre-stage. 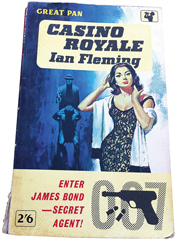 Ian Fleming published Casino Royale, the first of his James Bond novels. James Bond, resourceful and courageous, with the fastest cars and the latest technology, powerful and yet very successfully tender, impossibly handsome and dashing but working always On Her Majesty's Secret Service, was what every Briton wanted to be. Bond must have had a thoroughly sporting youth - another central British characteristic, but if we can assume he was a star at football and at tennis in the late 1940s it must also be admitted that what he did was not always cricket. Rules could be bent to overcome evil. We wanted to be him. And the world wanted to laugh with us. His missions, usually apparently impossible, always entirely secret, but none perhaps was as secret or as seemingly utterly impossible as his challenge in London in 2012. It is typical that at such a great moment of national and international celebration, at a moment both solemn and hilarious, the central and continuous element is the person of the Queen. If James Bond's service was always secret, then Her Majesty's has been unfailingly public. It is not often that grammar books give us a guide to life. But if you had recently looked up in Duden, the great reference book of German grammar, the word "die Queen", you would have found first a definition - "Britische Königin". There is then an example of how the word might be used, which amounts almost to prophecy: Die Queen kommt zu einem Staatsbesuch nach Berlin. And then finally there is one comment which says everything that needs to be said: there is no plural. We wish Her Majesty and His Royal Highness, whether travelling by land, by sea, or by air a very happy and very successful state visit to Germany. Die Queen an der TU Berlin - Sonderausgabe der Hochschulzeitung "TU intern"